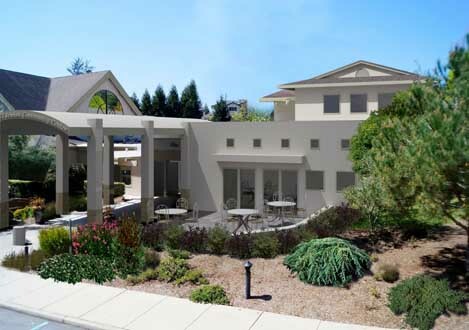 Our synagogue at 3055 Porter Gulch Road in Aptos, California, was built in 1989. 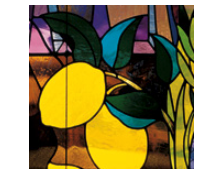 It features a beautiful, modern sanctuary with several works of Jewish art, including fabulous stained glass. Movable walls separate our sanctuary from the social hall, allowing us to expand to fit larger worship groups. The proximity of the social hall makes it easy for worshipers to cap the service with an oneg Shabbat (dessert) or kiddush (lunch nosh). Thanks for a very generous donation from Temple member Ed Newman in honor of Rabbi Emeritus Rick Litvak. The Litvak wing includes an office for Rabbi Rick, a cafe and a lounge for Temple youth. Groundbreaking took place in 2016 and the addition is now complete. 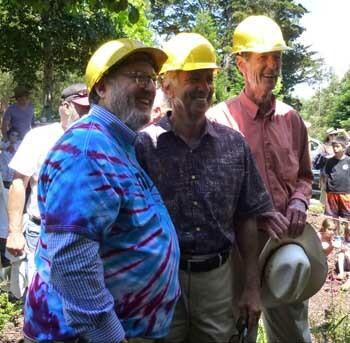 From left, Rabbi Rick Litvak, donor Ed Newman, and architect Teall Messer at the groundbreaking for the new Litvak Wing, which is shown at right in an artist's rendition. 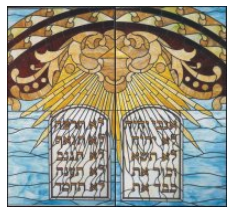 Sanctuary windows depicting the twelve tribes of Israel—a modern work of art by Maria Stolz (right image). Our social hall has been the site of countless celebrations, programs, and important meetings. It has a stage, and its commercial kitchen allows for catering full meals for a crowd. Our library contains a large variety of books on Jewish topics, including Midrash and Talmudic texts, Jewish ethics, theology, social science, poetry and fiction. It also has a children's book section. Our library contains the ark and reader's podium from our former synagogue on Bay Street in Santa Cruz, so we are able to use it as an intimate second sanctuary. Our school wing houses a preschool and six classrooms for our religious school. And, of course, we have administrative offices for our rabbis and staff. Temple Beth El Jewish Community Center has this beautiful facility because of the generous financial contributions of its members. These contributions come primarily through bequests, major donations, and a multi-year Building Fund pledge. We have two historic cemeteries. Plots in Beit Shalom (Home of Peace), on Meder Street on the west side of Santa Cruz are available only to members of Temple Beth El. Plots in our newer cemetery, Beit Olam (Eternal Home) in Soquel are available to all Jews, regardless of affiliation. We offer several rooms for rent for your events and meetings.